The procedural endpoint following cryoballoon ablation (CA) for paroxysmal atrial fibrillation (PAF) is pulmonary vein isolation (PVI), which is typically confirmed by entrance/exit block using a circular mapping catheter. The present study added an assessment of ablation gaps with high-density voltage mapping after standard confirmation of PVI. Relationships between the need for touch-up ablation, patient characteristics, and atrial arrhythmia recurrence were explored. 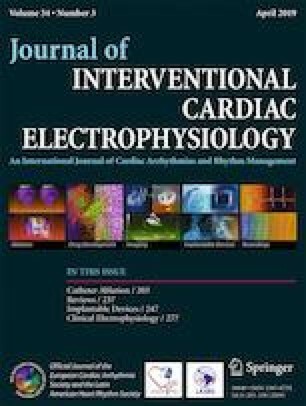 PAF patients received CA through standard of care treatment, with PVI assessed by bidirectional block confirmation, followed by voltage mapping. Radiofrequency ablation was performed as needed for voltage breakthrough and or additional rhythms. Freedom from atrial arrhythmia recurrence through 12-month follow-up was analyzed retrospectively with statistical survival models. A total of 77 PAF patients (age 66.1 ± 11.6, CHADS2 1.8 ± 1.0) were followed for 1.2 ± 0.3 years after CA. During the index procedure, pulmonary vein (PV) touch-up was required in 59 patients (76.6%) and ablation of additional atrial fibrillation targets beyond PV was required in 26 patients (33.8%). Kaplan-Meier estimates of freedom from atrial arrhythmia recurrence at 1 year were 62 ± 6%. Rates were lower for patients requiring touch-up ablation (58 ± 6% vs. 78 ± 10%) or with CHADS2 scores > 2 (33 ± 12% vs. 69 ± 6%). Cox regression models showed that the need for touch-up ablation increased recurrence (p = .045, HR = 2.6) after adjusting for hypertension and heart failure. The high rate of PV touch-up suggests that initial CA lesions may be less durable than previously assumed, while the higher recurrence rate in patients requiring touch-up may indicate that additional factors make these patients more difficult to treat. The authors appreciate the input of Megan Estes, Maciej Gonek, and Lee Ming Boo for their assistance in the study and manuscript development process. This study was funded by Biosense Webster, Inc.
R. Malik and B. Malik have no conflict of interest. TD Hunter is an employee of CTI Clinical Trial and Consulting Services, which is a consultant to Biosense Webster, Inc.
El Haddad M, Taghji P, Phlips T, Wolf M, Demolder A, Choudhury R et al. Determinants of acute and late pulmonary vein reconnection in contact force–guided pulmonary vein isolation: identifying the weakest link in the ablation chain. Circ Arrhythm Electrophysiol. 2017;10(4). https://doi.org/10.1161/circep.116.004867.